During my workperiod at the EKWC (European Ceramic Workcenter) I was inspired by the controversial German pathologist von Hagens. I was seeking the field of tension between attraction and repulsion. 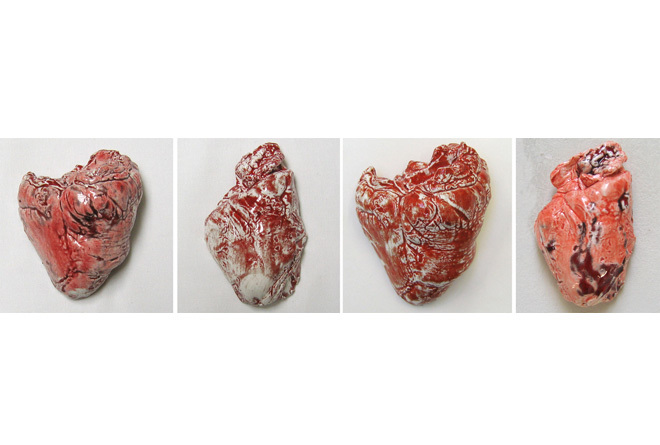 By using ceramics an enlarged and bloodied organ becomes an aesthetic object: a soft, weak and repellent organ becomes a beautiful one. I also researched the potential of transforming materials such as clothing, bandage, sponge – all of which have a relationship to the body – into ceramics. A process that embodies the same sense of contradiction.